Go to Google. Type in four words: Reggie Miller hall fame. What pops up fails to celebrate the longtime Indiana Pacers sharpshooter’s basketball career. One that was of course punctuated in 2012 with his induction into the Naismith Memorial Basketball Hall of Fame. The top three results? “Reggie Miller and 7 Other Overrated Hall of Famers,” “How Reggie Miller’s Enshrinement Hurts the Hall of Fame” and forum topic “Can someone explain why Reggie Miller is a HoFer?” all appear, even before Miller’s Wikipedia page. So, to all the doubters out there, let’s set the record straight: You’re trippin’. Miller, one of the greatest and purest shooters to ever touch a basketball, is an undoubted Hall of Famer. He ranks in the top 25 in all time in scoring. He ranks second all time in 3-pointers made with 2,560 — behind only Ray Allen, who broke Miller’s record in 2011 while Miller was calling the game. And Miller is one of only seven members in league history to be in the exclusive “50-40-90 Club” — a regular-season shooting mark of at least 50 percent from the field, 40 percent from 3-point range and 90 percent from the free throw line, with minimum requirements in each category. The argument against Miller’s induction essentially boils down to one point: He never won an NBA title. It’s often forgotten, however, that he made it to six Eastern Conference finals series and to the NBA Finals once. And he did it all with one team — never making “the decision” to leave and join a superteam for the sake of winning, instead remaining loyal to the franchise that drafted him 11th overall in 1987. And: What Miller lacks in trophies, he made up for in showmanship. His epic playoff battles with the New York Knicks, the eight points in 8.9 seconds in Madison Square Garden, his beef with film director Spike Lee, and, boy, his mastery of trash-talking. These are the parts of him that make the fact that he never won a ring easy to forget. But Miller — now an analyst for Turner Sports — doesn’t hesitate to reflect upon it all. What are you asked about most frequently — from fans and people you meet? Great question. There’s a few. I get a lot of, ‘I’m from New York …’ That’s how they start it. So I know what’s coming next. ‘I’m from New York. I hated you, but I respect you so much.’ I get that probably the most. Second most, ‘Where’s Spike?’ Third, they love to come up and do the choke sign. They think it’s so cool. What does Indiana mean to you — and what made you never want to leave the Pacers? Indiana is everything. People say, ‘What was your problem with Kevin Durant leaving Oklahoma City for Golden State?’ I have no problem with him leaving. It’s what the American Dream is. If you get a better offer … people relocate jobs all the time. I have zero problem with that. My whole … criticism was people need to understand the fans’ point of view, especially in small markets like Oklahoma City and, in my case, Indiana. Those fans, they live and die through everything you do. And I felt in 1987, Donnie Walsh took a gamble on me, and my whole purpose for those 18 years was to try to win a championship for those suffering fans, for that small market. Because it means so much. Reggie Miller (No. 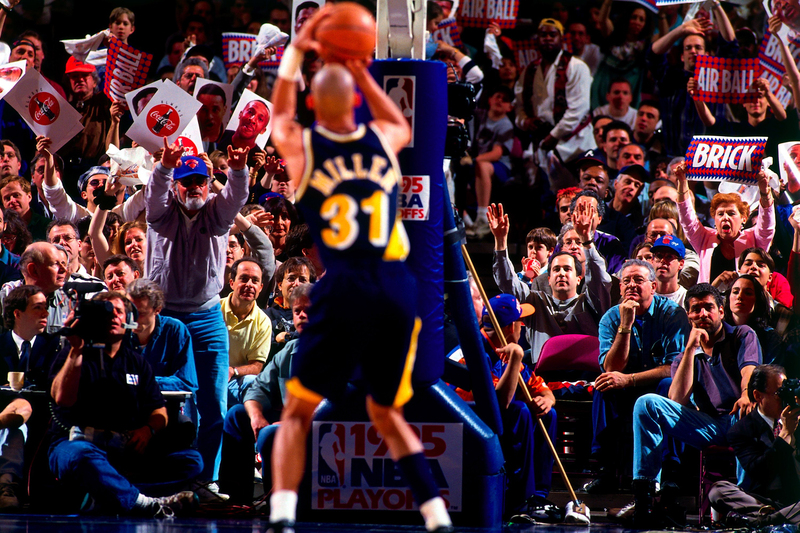 31) of the Indiana Pacers shoots a free throw in Game 1 of the Eastern Conference semifinals against the New York Knicks during the 1995 NBA playoffs at Madison Square Garden on May 7, 1995, in New York. We all can’t play in New York, Chicago, Miami, L.A. and big markets. That’s why I was critical of LeBron [James] for going to Miami, but so happy when he came back to Cleveland. To have your biggest and baddest dudes in small markets like the Cavs having LeBron and Aaron Rodgers being in Green Bay, it just makes the overall brand great. I have no problem with people changing teams, but I’m approaching this from the fans’ perspective, that’s all. Miller played the final game of his career on May 20, 2005, scoring 27 points on 11-of-16 shooting (4 of 8 from 3-point range) in an 88-79 loss to the Detroit Pistons in Game 6 of the Eastern Conference semifinals. Not bad for a then-39-year-old. A season that began with so much promise and hope for a championship had ended just short of the NBA Finals yet again. Miller says he knew the 2004-05 season would be his final year in the NBA, even though he didn’t officially announce his retirement until February 2005. Coming off a 4-2 series loss to the Pistons in the 2004 Eastern Conference finals, the Pacers were hungry for redemption with a deep roster that propelled them to a 6-2 start to the ’04-’05 season. Then came Nov. 19, 2004 — perhaps the worst night in the history of the NBA. With 45.9 seconds left in a game between the Pacers and Pistons at the Palace of Auburn Hills in Detroit, Indiana’s Ron Artest (now Metta World Peace) delivered a hard foul on Detroit’s Ben Wallace, leading Wallace to shove Artest. This sparked a scuffle between the two teams on the court. Tempers briefly calmed, as Artest lay down on the scorer’s table before a fan in the crowd threw a cup of beer in his direction. Artest leaped over the scorer’s table and into the stands. 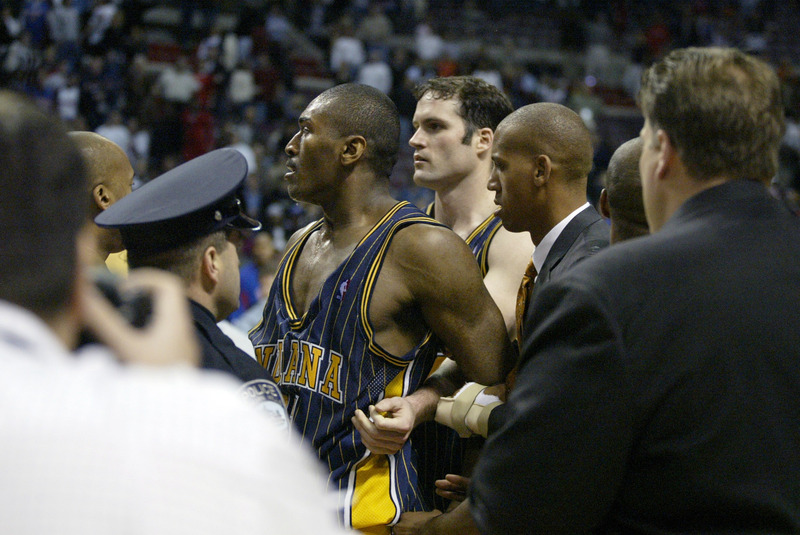 A brawl ensued, with other Pacers players joining Artest. Nine players total from both teams received suspensions following what has since been popularly dubbed the “Malice at the Palace,” five from the Pacers: Artest (remainder of the season, 86 total games with regular season and playoffs), Stephen Jackson (30 games), Jermaine O’Neal (15 games), Anthony Johnson (five games) and Miller (one game). Miller, who was on injured reserve with a broken finger at the time of the game, can’t help but think of what could’ve been with that team. This year marks the 12-year anniversary of the “Malice at the Palace.” What do you remember most from that day? Indiana Pacers’ Ron Artest is restrained by Austin Croshere and Reggie Miller (right) before being escorted off the court following their fight with the Detroit Pistons and fans on Nov. 19, 2004, in Auburn Hills, Michigan. That was such a surreal moment. You’ve seen your baseball fights between the pitchers, the catchers and the batters. And obviously football is a very violent sport. But you really hadn’t seen anything to that level … And certainly not going into the stands. It really felt like … and it’s funny … because I tell people that the whole ordeal may have lasted five to seven minutes, eight minutes. But it was in such slow motion during the middle of it, it felt like we were out there a half-hour. Being on injured reserve and being in a suit, one thing I wish I would’ve done is gone to Coach Rick Carlisle — because we were up by like 18 points with, like, I can’t even remember the time, it was like two or three minutes left in the game — and told him to pull the starters because we knew Detroit was going to be our No. 1 rival in the East. So we had the game in hand, on the road, let’s pull our starters. But when the whole ordeal went down between Ben Wallace and Ron, I was the one that was talking to Ron while he was on the scorer’s table. Out of the corner of my eye, I just see the cup coming in the air, and I’m like, ‘Aw, crap.’ And when it hit him, all hell broke loose. It’s surreal now that I can talk through it. It felt like we were out there a half-hour, but it really only lasted five or 10 minutes. Do you ever think about “what if” with that team? I really do. The year before, we had a really good team. But people forget, we added Stephen Jackson, who was going to be coming off the bench in his prime. A great defender and shooting guard. I mean, we were loaded and we wanted to go after the defending champions, and obviously a team in our conference, the Detroit Pistons. It was another missed opportunity, not everyone at full strength. Not having Jermaine for X amount of games, Stephen Jackson missed a lot of games and you know about Ron missing the rest of the season. We missed three core players for big chunks of the year and we still made the playoffs. And we still were able to advance to the second round. It just goes to show you what a lot of hard work, what great coaching, with Coach Carlisle and the coaching staff, can do — to prepare us every game. Remember, this happened in November. We had, like what? Seventy games left, 60 games left. We had a whole season left in front of us. This didn’t happen even halfway through the year. Part of the uniqueness of Miller’s basketball-to-broadcasting career path lies within his relationship with his older sister. Cheryl Miller is arguably the greatest female basketball player of all time, and established that standing in basketball history without even playing professionally. A 1995 Hall of Fame inductee, Cheryl Miller was joined by her brother in Springfield, Massachusetts, 17 years later, and together, they’re the only two siblings in history to enter the Hall of Fame as players, and only sister and brother to do so. Life after playing transpired similarly for them, as well. She joined Turner Sports in ’95, and a year later became the first female analyst to call a nationally televised NBA game. What does it mean to you for two members of the Miller family to be in the Naismith Memorial Basketball Hall of Fame? Cheryl and I are the only brother-sister tandem in the Hall of Fame — that in itself is a feat. It’s something special. It’s something that no one will ever be able to take away from us. Obviously, our parents and our brothers and sisters are proud of us, but they had a helping hand in us getting there, between mom and dad taking us to our baseball, basketball, flag football or volleyball games. It’s always been a family affair. What’s the best broadcasting advice Cheryl ever gave you? ‘Let the play breathe.’ Make sure you’re explaining it to someone who totally knows nothing about basketball. Because you have your casual fans who are flipping the channels and there’s a basketball game, and they stop for 10 minutes to watch the game. Be sure you’re explaining the game to them. So are you the ultimate expert on 3-point shooters? I wouldn’t say I feel like an expert. There were so many great shooters before me, and as you see now, there are so many great shooters that have followed. No. 1, it’s nice to be mentioned in the same breath as a Larry Bird, a Ray Allen, a Drazen Petrovic, a Klay Thompson, a Steph Curry. All these guys have unique qualities and attributes to their shooting. The one common thread that we all have together is we know how hard it is and how hard we’ve worked to hone our skill in shooting, especially in today’s game. As many teams and people are hoisting up 3s, it’s still a skill set. You gotta put the time and the effort in the lab working on your skills. So that’s one thing we all have in common. I think with my voice and my experience, I can just kind of lend my expertise to the topic of shooting. Some people might also say you have an expertise in the art of trash-talking. Who are some of the current players in the game that do justice to what you did during your career? No one really now. But people’s demeanor that like, that I’m like, ‘I can get on board with this.’ I love Russell Westbrook. I love his demeanor. I don’t know if he talks trash or not, but the scowl and the looks, see, I like that. I like that feistiness. I like that edginess. So Westbrook would be one. Isaiah Thomas of the Boston Celtics. He always seems to have a chip on his shoulder. You know, he’s 5-9, 5-10, if he’s wearing his big-boy shoes. But he plays with an edginess, a cockiness. I like guys like that. Click the follow button on one of Miller’s social accounts, and you’ll discover he’s always connected to the world — whether through photos and videos of him with his son and daughter, postgame Periscopes, or even while he’s 30,000 feet in the air. That’s where his #SeatmateSelfie series comes into play. Miller gets to know the person sitting next to him during a flight, and after the plane lands, he posts a photo of him and his new friend on Instagram with a recap of their conversation. How’d you start your #SeatmateSelfie series? I travel, people in our business travel a lot, and something I’ve noticed over the years is we are so consumed with our devices, social media, texting and talking on the phone. Just being in our own world and bubble once you get onto a plane. You never know who you’re going to sit next to. It’s all … random. I said to myself, ‘You know what? I’m going to make a concerted effort to get to know the person sitting next to me.’ You know, put down the devices and actually have a conversation with your seatmate — because you’re with this person sometimes an hour, sometimes five hours. That’s kind of how #SeatmateSelfie came about. I’d wait until they were done on their device or working, and I’d lean over and ask them a question. And ask them if they wanted to be a part of this. I’d say 95 percent of people are so elated to do that. Because no one’s ever really been interviewed. No one’s ever really asked them their favorite movie, their favorite food, their favorite vacation spot, their favorite sports teams. They’re just everyday Joes, regular Joes. To give them 15 minutes and to get to know them, I think that’s why it’s taken off so great because it’s just totally random people. Now, sometimes you get lucky and get Julia Roberts next to you, and it takes it to a different level. Looking back at your playing career, is there a moment that you wish you would’ve had Instagram or Periscope for? No. Absolutely not. And I find it fascinating and so difficult how today’s athletes are able to cope with social media. I was drafted in ’87, and in the ’80s and ’90s you really only had to deal with your local newscasters. You never really had to deal with everyday fans, and on social media, with people’s devices what they are — not only are they paparazzi because anyone can take a picture and post it anywhere now, but they’re journalists, informally, because everyone has an opinion. Sometimes good, sometimes bad. So I just don’t know how today’s athletes are able to cope with that. Maybe one day, if you’re lucky, you’ll take your seat on a Boeing 747, and after hearing the flight attendant’s dreaded words, “Please turn off and store all electronic devices,” you’ll look up and see Miller sitting right there next to you, smiling. Ask him who’s on his Mount Rushmore of 3-point shooters. Ask him about that time he and Michael Jordan fought — or the time he and Kobe Bryant fought. If you’re bold, ask him about the two free throws he missed at the end of Game 6 in the 1994 Eastern Conference finals that would’ve given the Pacers the lead, and maybe gotten them a step closer to the Finals. Ask away. Because it’s not every day that you get to talk to a Hall of Famer.